Motor Drive Analyzers provide complete three-phase power analysis from motor drive input through motor mechanical output, with results in a convenient Numeric table format. Motor speed, position, and torque integration are the most complete available. Long memory, per-cycle “synthesized” Waveforms and Zoom+Gate mode provide powerful dynamic drive and motor analysis. 8 analog input channels (MSO optional) with high resolution (12-bits), sample rate (up to 2.5 GS/s), bandwidth (up to 1 GHz) and memory (up to 250 Mpt/ch) provide unique capability to perform complete system debug on the motor drive power section, motor mechanical performance, and embedded drive control system operation. Power Analyzer instruments perform only one function, and typical 4 channel oscilloscopes have limited capabilities for three-phase power system analysis. 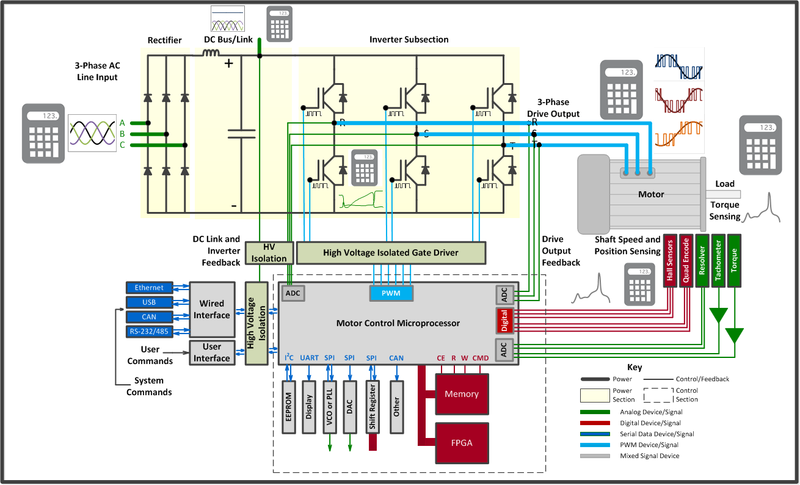 The Motor Drive Analyzer has 8 analog input channels (+16 optional digital channels) and three-phase power analyzer capability to debug the complete motor drive system. MDA Three-Phase Electrical Power GUI. MDA Sync Signal for Per-Cycle Analysis – Operational. MDA Dynamic Power Analysis Overview. MDA Mechanical Power Torque and Speed Interface GUI. MDA Numerics Table for Static Power Analysis.